Railroad Day 2019 is Saturday, July 20th. Follow us on Facebook. 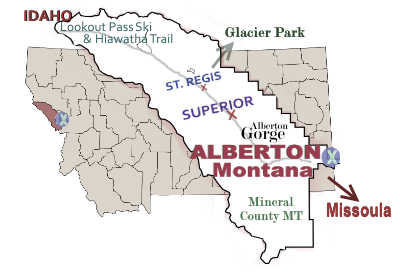 WELCOME TO ALBERTON MONTANA: Home of the Alberton Railroad Day Celebration & MORE ! The Town of Alberton will have two council member positions up for re-election this November. These will be four year terms. You must live in the town limits and have been a resident for at least 60 days prior to the election. The first day to file is April 18, 2019 and the last day to file is June 17th. To file fill out a Declaration for Nomination form and file it in Superior at the elections office. As summer approaches remember there are sprinkler regulations in the town. If your house number is even you water on even days, if your house number is odd you water on odd days. The times are from 7:00am to10:00am and from 6:00pm to 10:00pm. Dogs are becoming an issue throughout town. Dogs are required to be on a leash or confined unless voice command trained. They are also required to be licensed after 6 months of age. The cost is $10.00 annually for a non spayed/neutered dog or $10.00 lifetime for a spayed/neutered dog. We require rabies vaccination certificates. You can obtain the license at the town office during normal business hours. Join us on the Third Saturday in July here in Alberton, Montana, where we celebrate lots of occasions, but none so special as the annual Celebration of Railroad Days each summer. It's Free, Educational & Fun. Includes Parade, Contests, Games, Arts & Crafts & Food Vendors, Music All Day and an Evening Concert in the Park. You must come!